Tory cuts to local government budget are hitting Labour areas, the North of England and the most deprived councils hardest, according to analysis conducted by the Labour Party. Local authorities’ spending power per household is on course to fall by an average of 23% (£255) between 2010-11 and 2019-20. Yet Labour councils are set to see falls of 28% on average, compared to a 20 per cent fall for Tory councils. 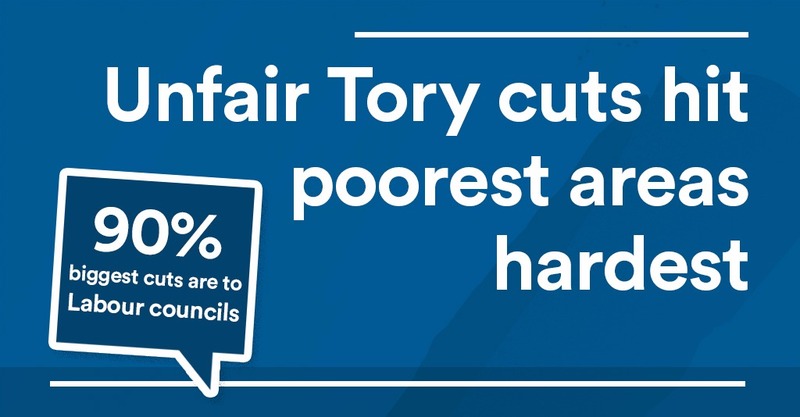 This means that while Tory councils will see an average fall in spending power per household of £128, the equivalent cut for Labour councils is more than £524 per household – more than four times higher than Tory areas. When looking at the worst affected councils, 9 of the top 10 local authorities set to see the biggest cuts to spending power are Labour councils, while eight out of 10 of the councils receiving the most favourable settlement over the ten years are Conservative-controlled. Regionally, London and the North East are set to see a cut over five times that of the South East of England, with the North of England is set to see a cut of over three times what the South of England will see. “Local government is under enormous pressure because of the ideological Tory cuts to our communities that are hitting the poorest hardest with ordinary families paying the price as councils are forced to cut services to fill the gap. “The Tories won’t stand up for working people, instead they are putting family prosperity and Britain’s future at risk. The Tories are hitting the most deprived areas hard. Knowsley, the second most deprived area in the country has received the fourth biggest cuts of any council.